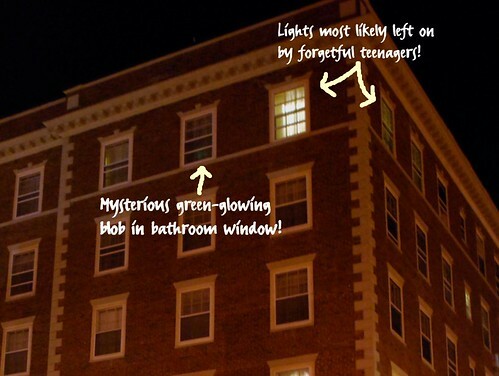 So ... my last post on the Hawthorne Hotel in Salem, Massachusetts had me wondering whether or not the girls had left the lights on in our room when we went out and didn't want to admit it or if a ghostly hand had emerged from the hallway and turned them on while we were gone. Truth be told, I'm thinking it was the girls who simply forgot but that still doesn't explain that mysterious green-glowing blob that has been showing up in some of my pictures - particularly around the sixth floor of the hotel. Either way, strange things were afoot in Room #612! 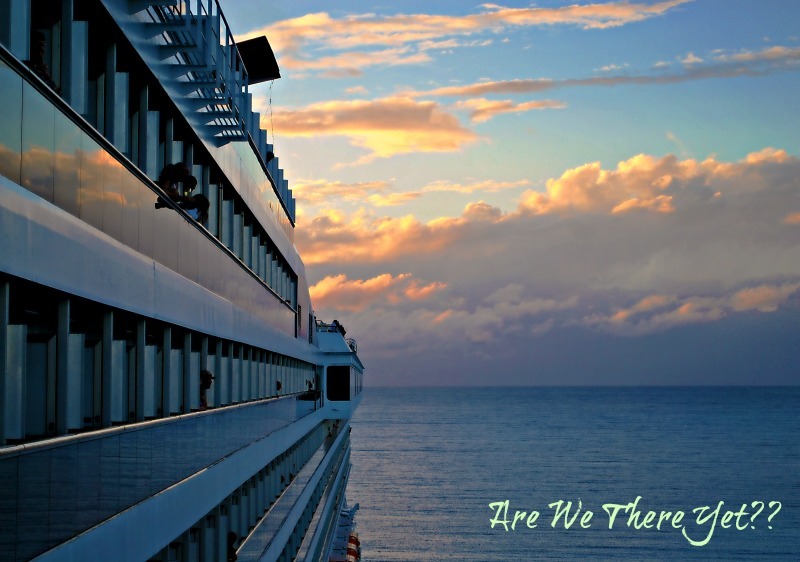 One of the amenities that the Hawthorne offers its guests is free WiFi internet access - something that comes in very handy if you a) write a blog and b) travel with teenagers who think it's the end of the world if they can't "connect" with the outside world! Trust me, I've stayed at places without it and it's not pretty, not pretty at all! Anyhow, after returning from "A Christmas Carol" and dessert in The Tavern, the girls immediately jumped on-line to let their friends know that they were alive and well and - hopefully - having a good time but there seemed to be some problems staying connected. Intermittently Amanda's MacBook would kick her off and Jamie was having the same problem with her netbook - issues that neither one of them were having the night before when we were in Room #325. Needing to download some pictures from the day, I booted up my Dell and voilà!, the internet worked just fine for me showing a very strong signal available. In the meantime, the girls were still having issues with being able to stay connected for very long no matter where in the room they tried sitting or what program they were running in spite of indications that they had a good signal. Odd. Finally things seemed to settle down and their issues were resolved but just about that time, I started to lose my internet connection off and on. I was trying to upload some of the pictures that I had just taken of the second floor lobby to Picnik so that I could do a little photo editing before bed but there was no way that was going to happen with the internet going on and off like a flashing neon sign in a dive bar. I decided that it was a sign for me to go to bed and give it up for the night. I told the girls I was going to go to bed and Jamie said that she'd be along a little later while Amanda decided that she was going to take a shower before she went to bed. Before turning in, I set my Nikon on the dresser so as to avoid any blur and took a shot of the bedroom using just the ambient light from the living room. I wanted to see if I was sharing the room with "anyone else" but it looked like I was alone. I decided to take the side of the bed next to the alarm clock as I wanted to use the BabySoothe application on my iPhone again for a little white noise - which I absolutely have to have in order to sleep properly. I plugged the phone into the charging dock just like I did the night before, set the program to "Waterfall", and listened to it while I finished getting ready for bed. I grabbed the camera to take a few shots after I had turned out the light and climbed into bed just "in case" and as you can see, it looked like I was still all by myself. 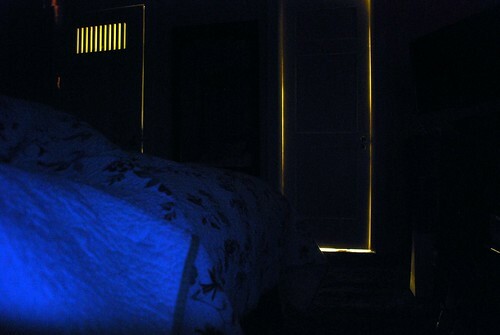 Not that the lights from the bathroom and the living room area as well as the blue glow from the alarm clock don't lend a bit of an eerie feel to things but it would have been a lot more eerie if there were some mist in the picture, too! Having fooled around enough for the night, I put the camera away, rolled over to try to get some sleep, and that's when the lovely white noise from my iPhone started acting up. Instead of the nice soothing sound of a waterfall like it had been playing before I tried to go to sleep, I was now getting several pops followed by a hum before it would go back to the waterfall sounds. Odd. I sat up and turned on the bedside light so that I could take a look at things and see if the phone had moved in the charging dock or something but after turning on the light, it stopped making the noise and worked just fine. Hmmm, okay ... I turned off the light, laid back down, and moments later it started in again ... pop - pop - hum. I turned over and looked at the clock and it stopped; I rolled back over to my other side and it started again; I rolled back over and it stopped again. What the heck?? The alarm clock is the exact same type that I had used the night before in Room #325 and at no time did it have any problems at all so I was beginning to get a bit suspicious not to mention rather irritated as I wanted my white noise, darn it! I took the iPhone out of the charging dock, plugged it back in and made doubly sure that it was seated properly, started up the application and listened to the nice relaxing sound of a waterfall for several minutes before turning off the light and trying to get to sleep. Everything seemed to be working just fine until just as I was drifting off I was jolted back awake by two loud pops and a hum - again! Grrr ... rather than being spooked about the obvious problem with electronics in the room I was more concerned with not having the soothing sounds of water to lull me to sleep so I turned on the light (again), got out of bed, and dug the regular charger for my phone out of my suitcase. I took my iPhone out of the charging dock, hooked it up to its regular charger cord, plugged it into the lamp base, and started the application again. Much to my relief it worked just fine minus any irritating pops and humming. I climbed back into bed, rolled onto my side, and promptly fell asleep only awakening for a little bit when Jamie finally decided to go to bed sometime after midnight. The plan for the morning was for me to take Amanda back over to Montserrat around 9:00 so that she could prepare for her final semester evaluation later that afternoon so after I got up and got dressed, I roused her while leaving Jamie snoozing away in the big comfy bed. Gathering up the things she'd need, Amanda and I went out into the hallway and over to the elevator bank where the lights showed one elevator already on the sixth floor and another on the third floor. I pushed the button to open the doors of the one on the sixth floor and .. nothing. The doors stayed firmly closed and I said "Oh, here we go again with this darned elevator!" I pushed the button again - just in case - and wonder of wonders, the doors actually opened! We got in the elevator, Amanda pushed the button for the lobby, the doors closed, and we went nowhere. The elevator just sat there. I looked at Amanda, she looked at me, and at the same time we both said "This elevator is haunted!" At that exact moment, the doors of the elevator opened up and we stepped back out into the sixth floor hallway just as the second elevator arrived on the sixth floor and its doors opened. We jumped in that one, pushed the button for the lobby, and waited as the doors closed to see if we'd actually go anywhere this time. Luckily, we did and as we arrived in the lobby, we both decided that there was something definitely hinky with the elevators - at least when it came to the sixth floor! When I got back after dropping Jamie off she was sitting in the living room area happily chatting away on-line with her friends on the netbook computer. I asked her if she was having any issues with the internet going in and out like it did the night before and she said that nope, it was working quite well with no interruptions at all. We got everything packed up as we got ready to check out and after making sure I hadn't forgotten anything we made our way down to the elevators for the ride down to the lobby. I was rather curious to see what would happen this time but as soon as Jamie pushed the button, the doors slid open to the elevator that was already on our floor (the same one that had just sat there when Amanda and I got on it), and we had no problems as it ascended downstairs. As we exited into the lobby Jamie said to me, "They must have fixed it since last night" and I laughed to myself a little bit knowing that it sure the heck wasn't fixed earlier that morning when Amanda and I used it! 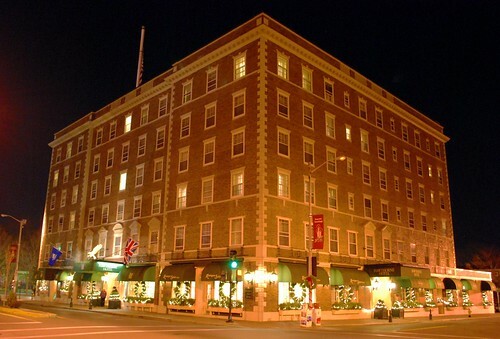 During check-out, the desk clerk asked me if we'd had any sort of ghostly experiences in the room but I honestly couldn't say that we'd see any apparitions or felt any icy touches or heard any voices that didn't belong there. Both of the girls and I had slept pretty much like rocks so if anything had gone on, we'd obviously missed it! Still, we'd had a wonderful stay at the Hawthorne and been treated like royalty by everyone. I get the distinct feeling that all guests of the Hawthorne get the same treatment but when it's happening to you, it most definitely makes you feel special! So ... in conclusion, is the Hawthorne haunted? Well, if you count cold spots, strange smells, bathroom doors that close on their own, strange green-glowing blobs that show up in pictures, electronics that don't work properly, and elevators that like to give you a hard time then I would have to say most definitely but if you only count full body apparitions and Jacob Marleyesque theatrics then you're going to be disappointed. Still, with their customer service, beautifully appointed rooms, marvelous places to eat, intriguing history, perfect location, and attention to detail I've got to think it's pretty darned hard to be disappointed about anything with the Hawthorne Hotel! I know for a fact that I'll be going back again just as soon as I get the chance! Oh, when you book your reservation, be sure to tell them that I sent you! I can't wait to hear about your next big adventure! wonderful stay! 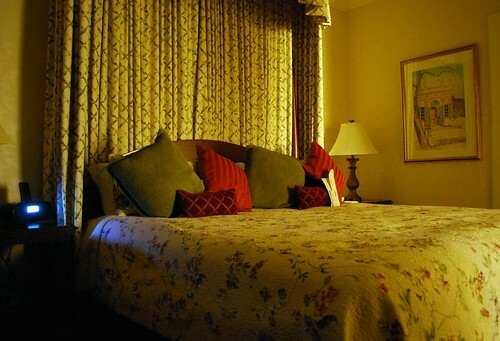 i love hawthorne suites and we stay in them whenever possible! No ghosts? Darn the luck. I won't have to tell them you sent because you'd probably be with me! hahaha! Shame you didn't get any 'ghostly' pictures but the interference with your electrical equipment and the lift was odd wasn't it? I wonder how many people visit just because it may be haunted? Just saying. I'm glad you all had such a wonderful time. awesome post. I think I would be both intrigued and scared if there were any hauntings while I was there. But "they" say that electronic disruptions are a sign of something. Great series, Linda. Seems like it's just enough spookiness for both sides of the question. Some would say it's just coincidence, while others would say it's haunts. But it certainly sounds like you enjoyed the experience!